With the combination of the ability to easily create a portable application out of any software and reasonably large size USB flash drives that are getting more affordable, this allows us to store more files such as documents and even applications to the disk. Nowadays a computer technician is only required to bring along their USB flash drive containing their collection of tools such as antivirus rescue disks to repair a computer unlike many years ago when they had to carry a CD wallet. As time goes by, the accumulated programs on a USB Flash drive can be by the thousands and it may not be that easy to locate and launch the intended program not to mention keeping them up to date. Searching for the program is a waste of time. Alternatively you can store the programs in different folders according to their categories but a more efficient way is to just use a portable application menu software which is designed to manage and to launch portable applications from USB flash drives. There are easily around 20-30 such application launching programs if you include the start menu replacement software with most of them offering nearly the same features with different eye candy effects. So in this article we will only list the application launchers that have the additional built-in functionality to automatically download and update portable apps on a USB flash drive. If you’re searching for a legitimate and trusted pre-made portable application, your best bet would be from PortableApps.com. Currently they maintain over 300+ portable applications that are spanned across 10 different categories. 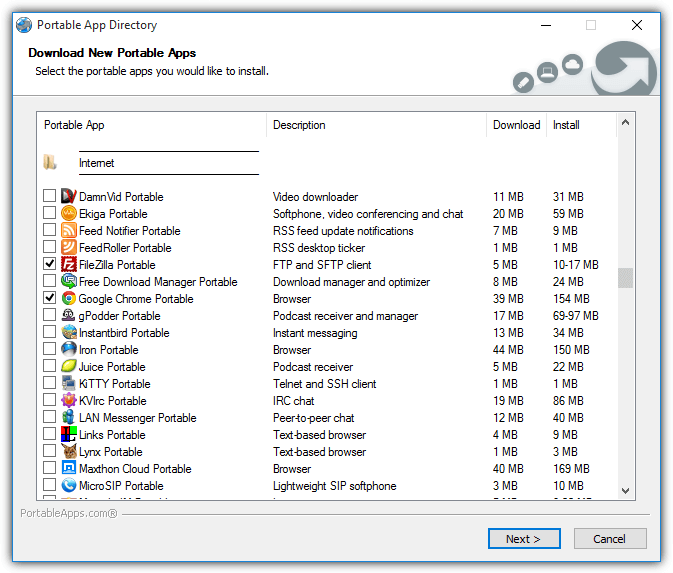 By using their PortableApps.com Platform program, you can easily and automatically install or update the installed portable application on your USB flash drive with a click of a mouse button. Go to Apps > Get More Apps > By Category. 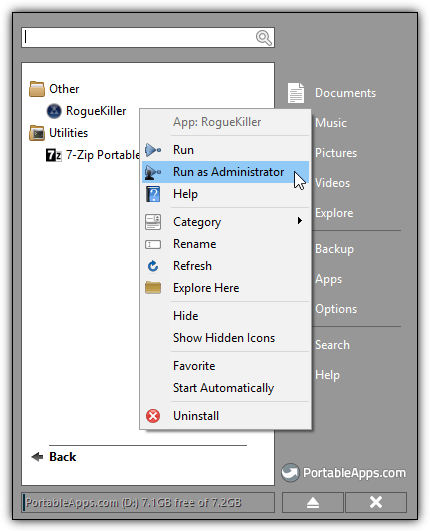 If you’d like to add a non portableapps.com application to the platform launcher, all you need to do is create a new folder inside the PortableApps folder and copy the program files into the new folder. The PortableApps.comm Platform can automatically add a shortcut to the list of programs by clicking on Apps, then “Refresh App Icons“. A convenient eject button can also be found at the bottom right of the program to quickly close the platform program and safely eject the drive. Additional Tip: You can right click at the listed programs in PortableApps.comm Platform which allows you to run the program as administrator, moving the program to a different category, setting it to start automatically and etc. 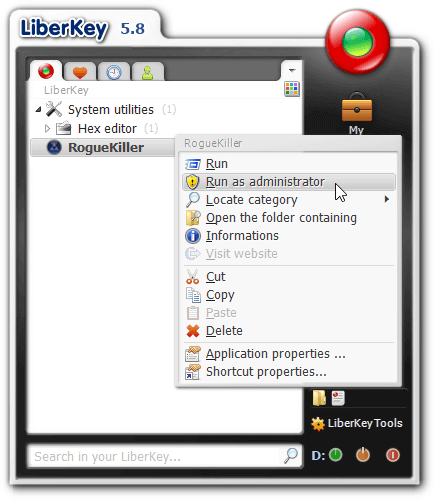 LiberKey is similar to PortableApps.com Platform where they have a huge list of nearly 300 ready made portable applications that can be easily downloaded and installed to your USB flash drive. The LiberKey feels a bit slow probably due to the excessive use of animation effects on menu, dialog and interface which fortunately can be disabled from the configuration. Installing pre-made portable applications to LiberKey is not that user friendly and slightly different if compared to PortableApps.com Platform. It is easy to install one of the 3 application suites (basic, standard, ultimate) but installing a single program will require to visit the online catalog which is actually their website that contains quite a lot of ads. 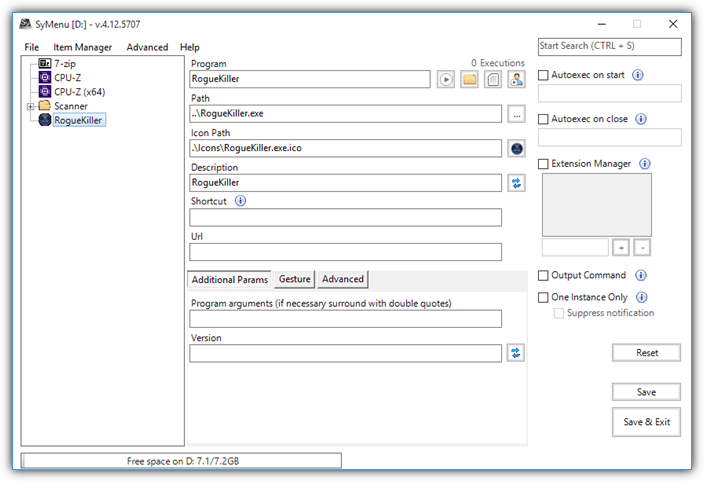 Adding your own programs to LiberKey program launcher menu involves quite a lot of steps. First you need to copy the program files to MyApps folder, click on LiberKeyTools button, go to Manage applications, and select Add / Remove programs. Click the Add applications button located at the bottom left and select “From MyApps Folder”. 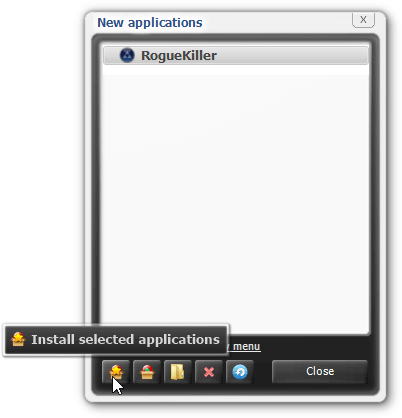 Click the Yes button to continue and any newly detected applications will be shown in the program window. You can choose where to create the shortcut, and finally click the “install selected applications” button. Additional Notes: If you look at the official LiberKey changelog and also the portable application version numbers from the online catalog, you’d have noticed that the development has slowed down. However, the administrator (vagabond) of LiberKey has posted a message on their forum stating that LiberKey is not dead and will return after the summer holidays. SyMenu may look like a simple portable menu launcher without the fancy eye candy animated effects but it is actually quite efficient which is one of the reason why GEGeek Tech Toolkit uses it to categorize over 600 programs. 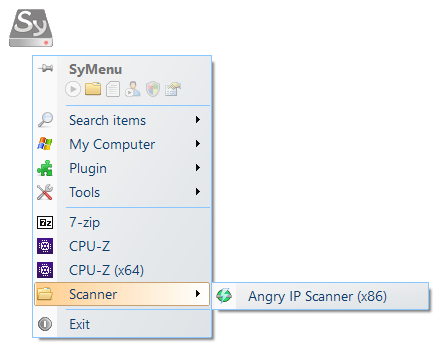 When SyMenu is running, you will find a small floating “Sy” icon that always stays on top of every window to conveniently access SyMenu. Alternatively, you can also show the SyMenu by pressing Ctrl+F1, or Ctrl+Shift+F1 to launch the search feature. Not only is SyMenu a portable menu launcher, it is able to easily download and install portable applications to your USB flash drive from four different sources. 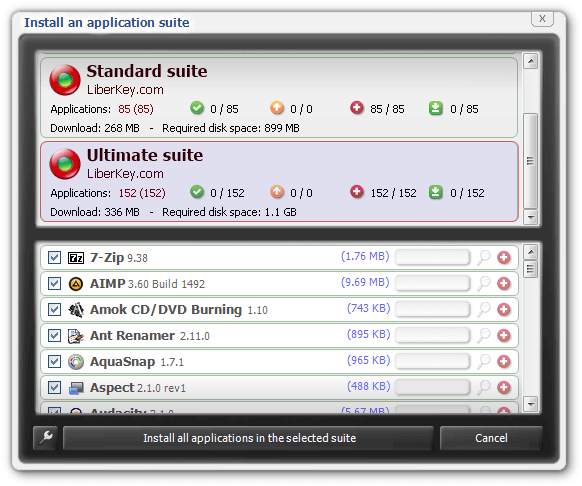 It includes every useful portable utilities created by NirSoft, Sysinternals, PortableApps.com and their own SyMenu Suite program list. You can launch the built-in downloader from Tools > Get new apps SPS. By default the list is empty so you’ll need to click at the “Get apps online” link located at the top right to download and parse the latest list. Do note that downloading portable applications created by PortableApps.com must be done from their plugin system. 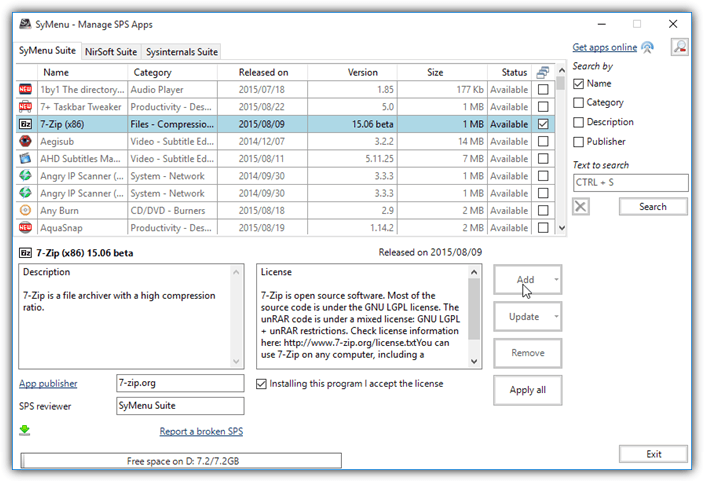 Go to Plugin, select “SyMenu PAF program suite” and click the “Get apps online” button to list the available portable programs to download. To add your own programs to SyMenu, copy the program to your USB flash drive, go to Tools > Configuration. Click on Item Manager at the menubar and select Add Program. SyMenu also comes with other useful features such as an extension manager that temporarily replaces the file extensions configured in Windows with SyMenu custom extension association. You can also configure to auto launch a list of programs when running or closing SyMenu. Additional Notes: We’ve excluded geek.menu because it is a fork of PortableApps.com Platform which hasn’t been updated for more than 3 years, and also CodySafe since it merely uses LiberKey’s portable applications. If you’re just looking for a simple and easy to use application launcher for your USB flash drive, we’d recommend Portable Start Menu created by Aignesberger Software GmbH, the same company that created the excellent Website-Watcher software. Portable Start Menu has a useful scan feature that automatically adds all EXE file to the application list. Other than that, closing the PSMenu will automatically close any running programs from the USB flash drive and safely remove the USB drive. A hotkey can also be configured to easily launch the quick start. is good. i like it. Whoa!!! That’s REALLY useful, good grief! Thanks heaps!!! I have been using PortableApps for a while. They have a good selection of apps. Their Portable Apps Creator 0.97.2 beta was useful when I need one that that was not available yet.